The narrator, an attractive English girl, is in a German pension, and a sharp observer of the other guests. Of all the German characters, only the portrayal of Sonia is at all sympathetic, but even then the narrator is patronising. The other Germans are uniformly gross: overweight and over-eating, ignorant, vulgar, humorless and unpleasant. Their personal habits are disgusting: in Germans at Meat the narrator is ironically taken to task for the preposterous English breakfast while the Traveller spears his potato with a knife and eats around it, the Widow picks her teeth with a hairpin, Herr Rat talks about his digestive system at table, and Herr Hoffman ‘wiped his neck and face with his dinner napkin and carefully cleaned his ears.’ In The Modern Soul Herr Professor makes pompous conversation with the narrator, recommending cherries as a means of making saliva before playing the trombone and spitting the stones into the flower bed. At the concert, a young ‘gentleman’ blows his nose twice before hurling his handkerchief into the bosom of the piano’. Mansfield was a bohemian, and her observations about snobbery are wry. She wrote this collection when she was establishing herself in the Bloomsbury set in London and as a colonial she must have been acutely aware of British class consciousness. She pokes fun at the German awe of their aloof Baron – and she can’t resist puncturing their reverence. It is her non-German narrator who is ‘honoured’ with a conversation and the offer of a shared umbrella she is caught in the rain, and it is she who learns that the reason he spends all his time alone is so that he can eat in peace. In The Sister of the Baroness Mansfield mocks the guests’ excited delight when the prestige of the pension is ‘enhanced’ by a Baroness sending her daughter to stay – but the baroness’s ‘sister’ to whom they have deferred turns out to be a servant. The none-too-subtle inference is that Germans cannot tell the difference between their aristocrats and their lower classes. Mansfield’s perspective on marriage, motherhood, childbirth and children is distinctly sour. Her contempt for German men in particular shows up in the vignettes about the birth of the Frau’s child. The doctor and husband have no conception of the pain of childbirth. They dismiss the Frau’s screams by comparing her to a horse; the father’s doubts are all resolved when it is a son that is born. When it dawns on the naïve young housemaid that there’s a connection between the attentions of men and motherhood, she panics and flees from the Young Man. If you check out the biography of Mansfield’s short life, you can draw your own conclusions about why she wrote this way. One story stands out as quite different. The Child Who Was Tired is an indictment of child labour, and it’s painful to read. I don’t know if children really were used as domestic servants in Germany at that time, but the portrait that Mansfield paints is horrific. The child is the illegitimate child of a waitress, rescued from her mother who tried to drown her in a wash-stand jug, and she is a bit simple. She is worked from dawn till beyond dusk, for even as she ‘thought of the nearness of bedtime [and] shook all over with excited joy’ she is harried into more work, looking after a party of friends who descend on the house in the evening. The stress of trying to keep the baby quiet, and her fear of the new baby that’s coming provoke a shocking ending. Source: Project Gutenberg, read on the Kindle. Mansfield is someone I must redress. Have heard so much about her over the years but have only read, as I recollect, one short story – and that was a long time ago. One of my JA group members did her PhD on JA and her Honours thesis on Mansfield. That tells me something doesn’t it! Yes, but it makes one a little anxious about blogging about an author of such serious scholarly interest! I want to read her too. I learnt a bit about her when I went to Wellington for a conference 18 months ago. I went to her childhood house, which is now a museum devoted to her. I bought the penguin collection of short stories, but of course, you know I haven’t started it. The good thing is that you can read her short story collections bit-by-bit! 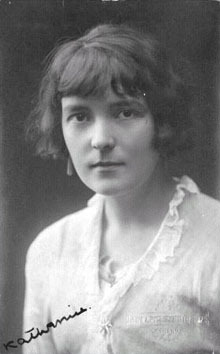 I heard a wonderful podcast on ABC’s The Book Show about Katherine Mansfield which enlightened me much more in terms of her career and what she was like. I know it shouldnt be about the person but she intrigued me and it really made me want to read her work. Where would anyone suggest I start? I think if you were planning to read more than one, then you could compare In a German Pension with The Garden Party which is her other very well known collection. I’d like to read that one I think. I rather like Germany and will be interested to read Mansfield’s views – although Wikipedia suggests she later thought this work was rather “immature”. You wrote an interesting and informative review here – I almost don’t need to bother reading the book! Oh, yes, you do, Tom – you mustn’t miss Mansfield’s inimitable style! Her stories are all readily available online at Project Gutenberg!